After the grand success of New Year Party (Hangover - 2017), Bravura Gold Resort once again presents Hangover - 2018 with a promise to make it one of the most memorable evening of your life. Come and celebrate New Year Party with your family & loved one's at Bravura Gold Resort with highly energetic DJ Tripti Sharma (DJ, Model, Producer & Remixed), who will set the dance floor on fire !!! 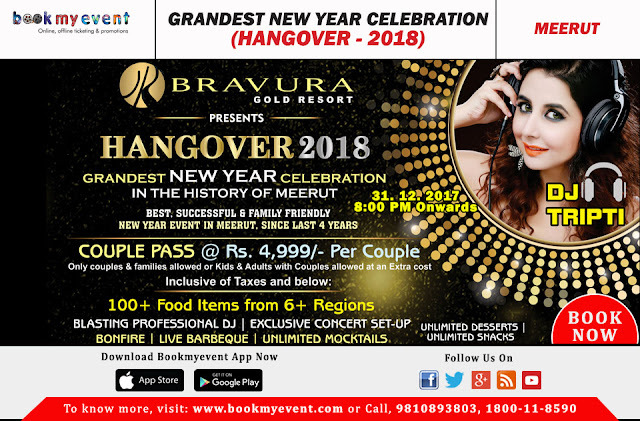 This New Year Grand Party consists of Blasting PRO-DJ, Live Barbeque, Unlimited Mock tails, Unlimited Desserts, Unlimited Snacks and much more that will take you at the end of entertainment, fun, masti and pleasure. This is a celebration you wouldn't want to miss!!! So, don’t wait and get your tickets to be a part of such a great event. • Blasting Pro-DJ with Celebrity DJ Tripti Sharma (DJ, Model,Producer & Remixer). • 100+ Food Items from 6+ Regions.